The San Diego State University Police Department is set to open a new substation next week in an aim to increase law enforcement presence on the east side of campus, the university announced Monday. The new station will open Feb. 26 in College Square at College Avenue and Montezuma Road in a building recently renovated by the school’s housing department. The police headquarters, located on the west side of campus, is currently the only police outpost at SDSU. Students, faculty and staff will be able to visit the station for police services and information about training and safety resources. Its reception area will be staffed by a community service officer, the police department said. 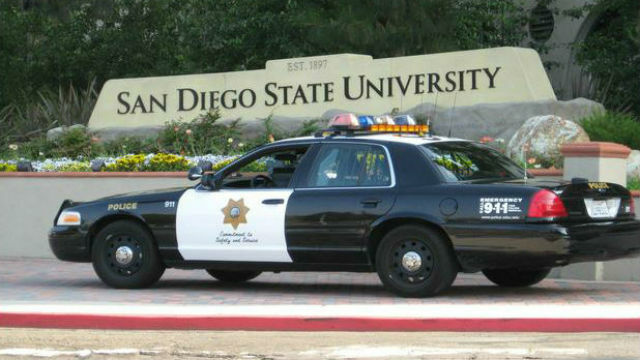 The SDSU Police Department responds to nearly 45,000 calls each year. SDSU is in the midst of rolling out a requirement that non-local sophomores live on campus. Previously only freshman were required to stay in university housing. All non-commuting sophomores will be required to live on campus beginning fall 2019, which the university said follows research that shows students who live on campus do better academically and enjoy a greater sense of community. The school enrolls nearly 34,000 students.